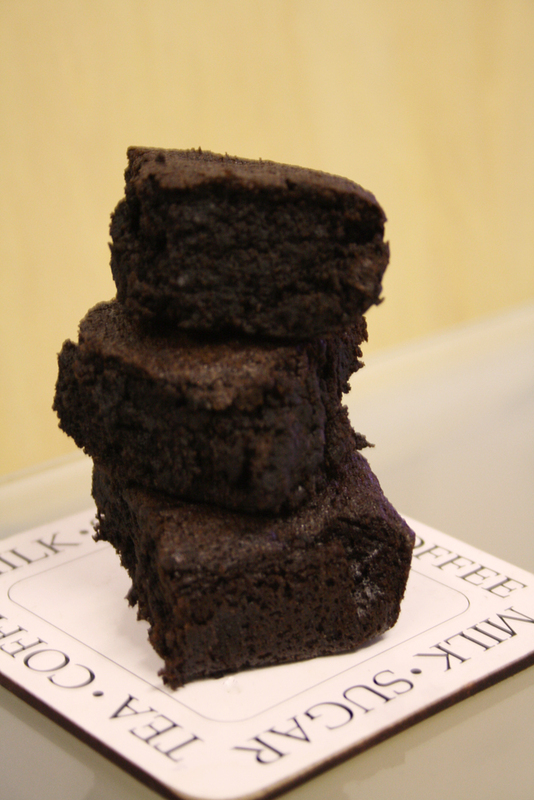 Rum and raisin chocolate brownies - Gluten free. A scrumptiously boozy treat that also happens to be gluten and dairy free! It's rum soaked content means that you could almost get away with calling it a 'festive treat', almost.. Inspired by the classic ice cream flavour and chocolate treat, this free from bake has all the flavour without a trace of pesky wheat in sight! Since starting my long diagnosis journey with coeliac disease I've been experimenting with more free from bakes, baking tasty treats that don't leave me with that uncomfortable feeling afterwards. 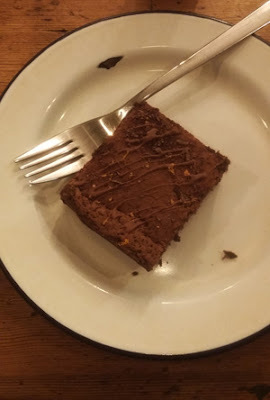 This is another one of those tried and tested, and very quickly devoured treats, that you wouldn't suspect was dairy free, it's just as deliciously moist and squishy as a normal brownie! Making for a rather scrumptious free from treat. Prior to baking pre-soak those raisins in the rum for a truly scrumptious boozy bake. Ideally you'll want to do this overnight, or for at least 3-4 hours before baking. I used Appleton Estate's Signature blend for my brownies, this is a gluten free rum so it's perfect for this bake! Before you start on your brownie mix, melt down the stork on a low heat to add to your bake. This helps to add moisture to the bake, in place of your usual melted chocolate in a brownie recipe. Set aside. Pre heat your oven to 180c/160c fan/gas mark 4, grease and line a square baking tin (mine is 20 x 20cm). In a large bowl add the brown sugar and caster sugar, using a mix of these two sugars helps with the rich, squishy consistency of the bake, whilst also adding a bit of crunch to the top. Add the gluten free flour, baking powder and cocoa powder to the mixture and stir to combine. In a jug beat the eggs together, then add to the dry mixture and stir well to combine. Followed by the melted butter, this should loosen the mixture to a dark, rich and runny consistency. Lastly, you'll want to add the boozy raisins with the remaining rum in the bowl. Stir to combine with the mixture. Spoon the mixture into the tin, then bake for 40 minutes till firm. 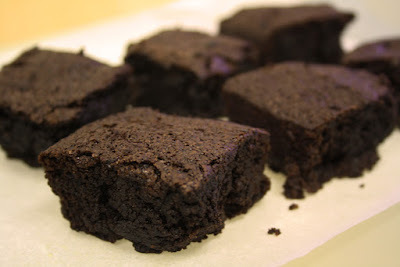 The brownies should look crunchy on the top and a skewer should come out clean when placed in the bake. Leave to finish off in the tin for an hour before removing. 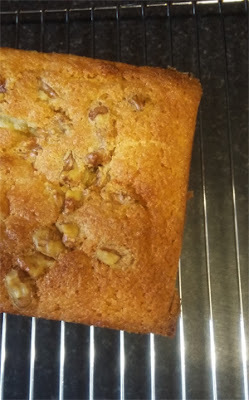 You may want to drizzle a little more rum over the top of the cake once you've removed it from the oven. Use a cake skewer to poke holes in top of the brownie, then sprinkle 1 shot of rum on top. This will soak in straight away, adding more tasty boozy content to your bake! You may find it easiest to slice the brownies into squares before removing them from the tin. 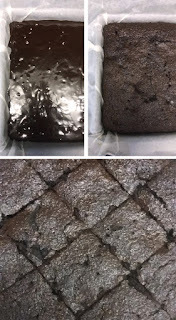 Lining the tin also makes it easier to remove the brownies to place on a wire rack to cool down. 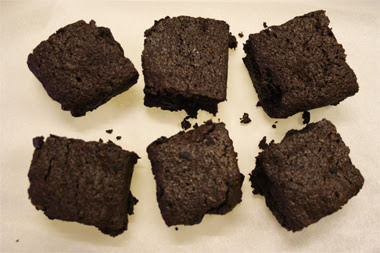 Of course, these do taste best when still slightly warm, so you may want to tuck in after the brownies have cooled down for an hour or so, pretty much as soon as you remove them from the tin. They do also taste just as scrumptious when cooled down, the rum really adds a lovely boozy touch to the bake and pairs well with the chocolately flavour! Yum! Learning to live with your gut : Being diagnosed for Coeliac disease. During those long months awaiting your first appointment with the consultant it can be a right nightmare, hours spent hugging a hot water bottle after you've gluten'd yourself, and accepting Pepto Bismol as your new best friend. For some this is the normal journey as they await their coeliac diagnosis, but for me I still have several months to go.. It's only been a couple of months since my blood test, but already I still have an awfully long way to go, as I type this it's in-fact 32 weeks to go until I even get to see the consultant.. the past eight weeks since I received my referral letter have been a right roller-coaster. Knowing that it could be months until I'm seen to start the diagnosis procedure, I'm expecting a long seven months of gut pain, chronic flatulence, sudden panicked dashes to the loo and plenty of foggy, tired days. Looking back at the past year since I discovered my lactose intolerance the symptoms were obvious, I just convinced myself that it couldn't possibly be gluten intolerance as my symptoms were far less severe than those of my diagnosed relatives, little did I know. After receiving the bad news regarding my referral I decided to try everything and anything to get to the bottom of my symptoms, so I could greet the consultant with a full list of my problems and the solutions that I've tried to get to the bottom of what's causing the constant upset in my gut, that is whenever that glorious day finally arrives. Armed with a trolley, and a wealth of knowledge already gained from going through the experience with my relatives as they began their journey without gluten, I decided to try a couple of weeks without gluten in my diet to see how my body reacted, and if there was actually any improvement in my symptoms. Thankfully, I've already grown used to life reading food labels from my issues with lactose, but it never dawned on me just how many gluten free products contain milk, knowing that the two issues often go hand in hand this surprised me somewhat. It looked like my new temporary diet was looking a little more difficult, especially for someone who can't have a cuppa without a biscuit, or two.. or a generous slice of cake.. The next two weeks were a revelation, those first few days may have been no different to usual, but a few days into my temporary gluten free diet I had a feeling I'd not had in a very long while, a quiet gut.. waking up without the sounds of an orchestra tuning up, accompanied by chronic bloating and gas was a new, certainly most welcome sensation. As the days progressed my gut felt happier with me than it had in an awfully long while. Gone was the hilarious flatulence, the loud groaning sounds emerging from my stomach. Suddenly, I really wasn't looking forward to re-introducing gluten into my diet..
For me, realising that I really did feel better on a gluten free diet was like a weight had been lifted, I always knew that there was something wrong with my health, but it was a matter of my gp taking me seriously to get to bottom of it, and I can't tell you how many times my constant problems were dismissed and shrugged off. Then came the day when I knew I had to re-introduce gluten back into my diet, I wasn't dreading it as such, I just wasn't sure what would happen at first. Sure enough, a couple of hours after tucking into my wheat filled breakfast an uncomfortable twinge started emerging from my gut, one that could only be described as feeling like I had a chestburster waiting to emerge from my stomach. Whilst it most likely was the gluten that caused this gut clenching sensation, I wanted to be sure that it really was gluten that was irritating me, just one case of digestive discomfort wasn't enough for me to feel comfortable saying that it was most likely the cause of my problems, so I went on another gluten free week to confirm my suspicions. Sure enough, the next time I re-introduced gluten after a week without it in my diet that same uncomfortable, gut wrenching feeling came back, leaving me clutching a bottle of Pepto Bismol to soothe my symptoms like I've done many times before when I've had lactose. For me, this was enough to confirm my issues with gluten. Sure, it may or may not be coeliac disease, but it's certainly something that's not helped by eating gluten. The side effects of re-introducing gluten into my diet was enough to at least confirm my suspicions, ok so it's still Schroedinger's coeliac disease at this stage, but knowing that gluten was playing a part in my health problems was enough for me. Whilst I still have what feels like an awfully long journey to go until I start to be diagnosed, beginning to get to the root of my problems personally is a great starting point. I'm just not looking forward to several months keeping gluten in my diet and the affects that it will have on my health and my work. As I still face another 32 weeks of uncertainty, at least I'm starting to get somewhere, I just hope it that it doesn't leave me with a chronic addiction to the pink goo known as Pepto Bismol after everything..
Gluten and dairy free chocolate orange cupcakes. 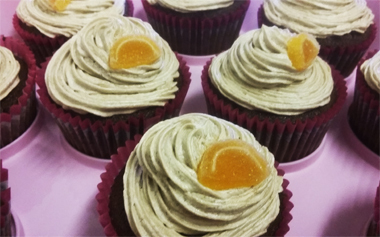 A deliciously free from treat that has all the scrumptious flavours of a chocolate orange, Terry himself would be fighting you to the death for the last one of these! Made even more scrumptious with a surprising addition to the bake, that perfectly re-creates the flavour of the tasty treat without any dairy in sight! Why no dairy or gluten I hear you ask, as someone who is currently awaiting a biopsy for coeliac disease I'm already finding that wheat disagrees with me, not to mention the irksome addition of my lactose intolerance, making over indulging on treats a bit of a pain at times, so this tasty new recipe is perfect for any fellow sufferers! Pre heat the oven to 180/160c fan/gas mark 4 and line a cupcake tray with cases. Cream together the margarine with the sugar till pale and fluffy, much like you would with butter however this should mix together much quicker! Add in the eggs one at a time and mix. 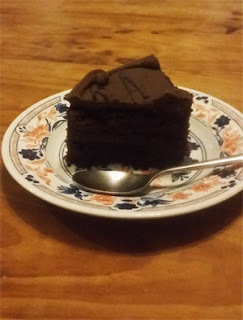 Sift in the gluten free self raising flour, I used Asda's own blend for this bake, one that I've always used even before I started my diagnosis to make tasty treats for my coeliac relatives! Sift in the cocoa powder and mix. Add the Choc shot to finish and blend, I picked up a tube of this lovely stuff at the recent Allergy & free from show in Liverpool in my goodie bag and just had to use it for a bake (F.Y.I - it also tastes amazing in a hot chocolate with coconut milk, oh my!!). 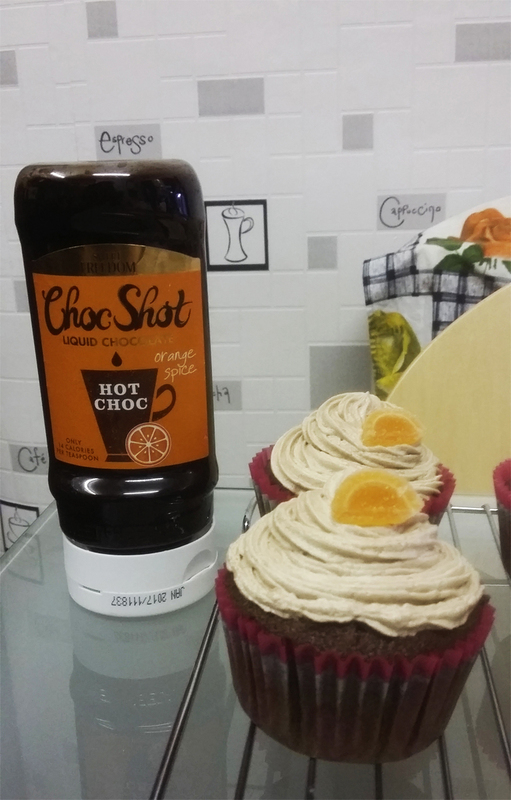 The Choc shot will help to add the classic flavour of the Chocolate orange to your bake, without using any dairy! Stir to mix in, then finish off by adding the coconut milk and blending, this will help to add some moisture to your bake. Spoon the mixture into your cases, filling each around 2/3 full, then bake for 15-20 minutes till risen. Remove the tray from the oven and leave your cupcakes in the tray for 10 minutes to finish off, then place on a wire rack to cool. 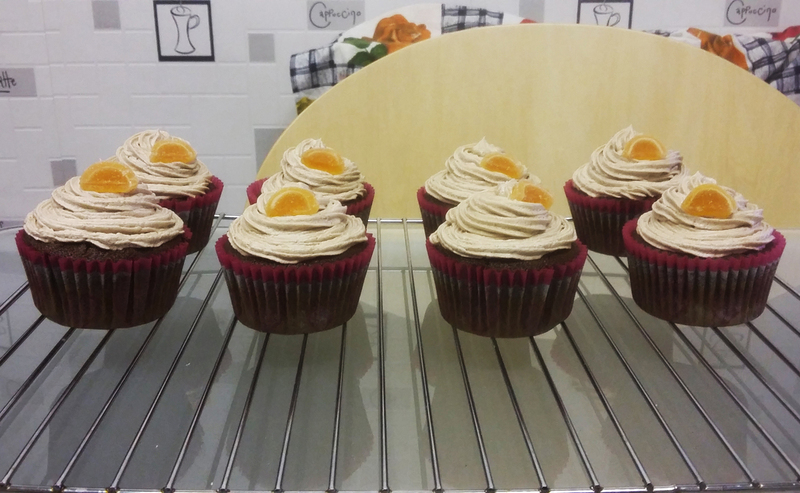 Whilst your cakes cool mix your frosting to top the cupcakes. Mix together the margarine with half of the icing sugar till fully combined, then sift in the remaining icing sugar and whisk for 2-3 minutes. Add the Choc shot to the frosting and whisk to combine, this will make the frosting taste utterly delicious! 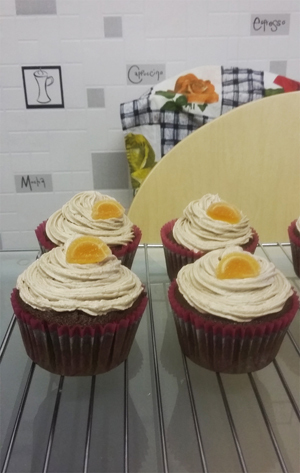 Spoon the frosting into a piping bag with a star nozzle and pipe swirls on top of each cupcake to fully cover, then finish off by piping a smaller swirl in the centre of each cake. Top with an orange jelly sweet to finish! The end result will be a scrumptious, chocolately bake with a lovely orangey twist! These will last well kept in an airtight container for a few days. Recipe adapted from: Doves Farm.